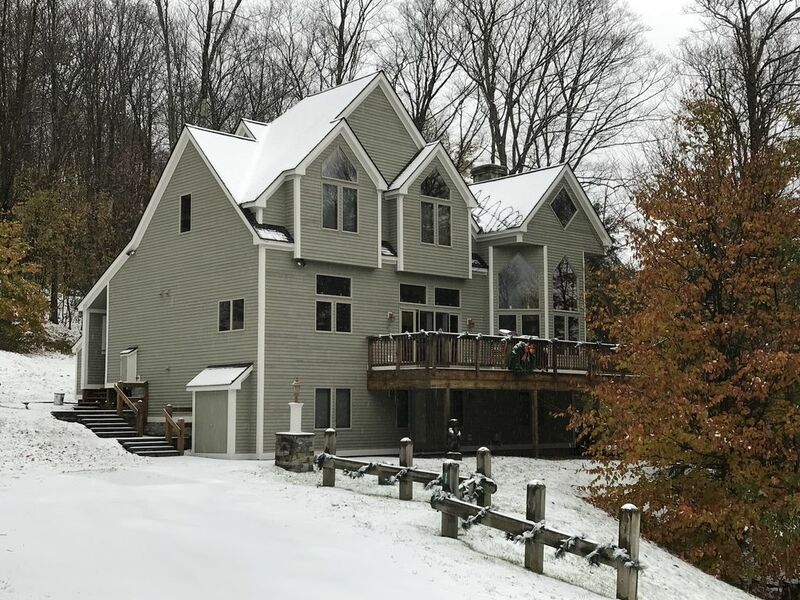 Beautiful custom-designed, spacious ski home ideal for relaxing, entertaining, cooking. Upper level sanctuary includes two master bedrooms with flat screen TVs,bathrooms with jacuzzi tubs. Main level offers large mud room with washer/dryer. Open floor plan includes great room with 25' stone fireplace and wet bar; dining room seats 10; fully equipped gourmet kitchen with breakfast bar seats 4; half bath. TV/cable/DVD/VCR Bose surround sound stereo system. Lower level includes additional family room great for kids, TV/DVD/VCR/cable. Four bedrooms and two full bathrooms. Two pack and plays (bring your own sheets). High chair. Hot tub on back deck seats 8. Gas grill on front deck with outdoor seating. Wireless internet. Puzzles/games/cards provided. Wii game console. NO SMOKING/NO PETS. Linens provided. Minimum age limit for renters. House is located on Okemo Mountain: Shuttle bus comes every half hour to end of street in winter to take you to Okemo base lodge three minutes away or Jackson Gore. Better yet have someone drop you off at ticket window, they will be back before their coffee cools. Okemo rated in top 50 in the Northeast and top 10 in Ski Magazine as the most family-oriented mountain. Mom and Dad can enjoy a day of skiiing while their children learn to ski from the skilled instructors at Okemo. All can meet at the end of the day for a hot chocolate or Tomahawk in the Sitting Bull. Winter, Spring, Summer or Fall, this house has it all. Come in the Winter and ski during the day. Hot tub under the stars and then enjoy cocktails by a cozy fire. Come back in the Spring and Summer to golf and/or shop at the Manchester Outlets. Travel to Quechee for lunch at the Simon Pearce glass factory. Enjoy a day at Plymouth State Park for swimming or rent a rowboat, kayak or pedal/paddle boat-7.3 miles away. Come in the Fall to enjoy the beautiful foliage. Enjoy the local restaurants all year long. Take a trip to sample some of Vermont's local beers at Long Trail Brewing Company in Bridgewaters Corners or Harpoon Brewing Company in Windsor. Great home for family reunions, golf outings, girls weekends, Summer Theater at Weston Playhouse or just some rest and rejuvenation. This is a NO SMOKING and NO PETS home. Located on Okemo Mountain. Once up access road, you don't have to go down again until you leave. We spent the weekend at this home celebrating a family birthday. The layout of the home was so perfect for entertaining a large group. The main floor is very open with plenty of different seating options. The kitchen was wonderful and had everything we needed. We especially enjoyed how there was space in the lower level for the kids to run around and watch TV while the adults could talk on the main floor. Many people commented that it was actually quiet and we had over 10 kids one evening. My friend that came over said the pictures online did not do the home justice because it was so large and open. He also commented how the house was so clean and well taken care of. The house was well appointed with plenty of towels, sheets and toilet paper (some rentals we have stayed at in the past were skimpy on these details) which made everyone so comfortable. The hot tub was amazing and we are all looking forward to when we can go back. The only tricky thing was figuring out the trash and recycling situation and the muddy road with DEEP ruts. Then again it was March = mud season in VT. 4 wheel drive was a MUST for the street. The house is fabulous for a get away ski vacation. Close to Okemo. Beautiful house which is very well equipped. Would have loved to have had a few of the bedrooms with twin beds as we had many singles. But ample room for all. 10 of us across two families stayed at this lovely house for a ski weekend. It’s super close to the clocktower base at Okemo and close to the local restaurants and shops. Our hosts were quick to answer any questions we had. There is plenty of bedroom and living space in the house and it has everything you’ll need for an enjoyable getaway. We’ll definitely be back in the future. My friends and I recently spent a ski weekend at the home and had a great time. The house is in a great location to the Okemo Mountain Lodge. Very spacious and comfortable for a large group. The open kitchen/dining/living room was perfect for relaxing in the evenings. This is the 2nd year that a group of us have stayed in this fabulous house! It has everything you would need, and comfortably accommodates 12 adults in double rooms and a few kids. I hope we will be back again soon! Thank you! My extended family and I stayed at Casa Rodriguez after Christmas and had a great time! The house accommodates a bigger group really well and allows for plenty of space when you're not on the slopes. I found the owner easy to deal with and very responsive. The house was clean and the kitchen was well stocked with everything you need for preparing meals. We will definitely be going back to Casa Rodriguez. Golf: Nearby golf courses include Okemo Valley Golf course; Tater Hill, Equinox in Manchester, Crown Point Country Club Springfield, VT; Killington Golf Course; Woodstock Golf Course. Too many to name. Ski: Casa Rodriguez is located 1900 feet from the Okemo ticket window. Close enough to walk or you can take the shuttle bus, which is three homes from our house, and comes every half hour.